signed: Bottom edge has: "Bruce Kaiper '74" in pencil at right. inscription: Bottom edge has "9/20 For Evelyn, a fighter for justice and / liberty. In friendship" in pencil at left; "Oppression Breeds Violence" in pencil at center; and "Bruce Kaiper '74" in pencil at right. Poster has a thick white border overall. Poster has a black background. The upper left portion of the poster has a photograph of three police officers wearing wide brimmed hats and masks that conceal their entire faces. The officers are standing near a car that has the text: "State Police" on it. Behind this image there is a blue square with stylized yellow and orange flames at the bottom. 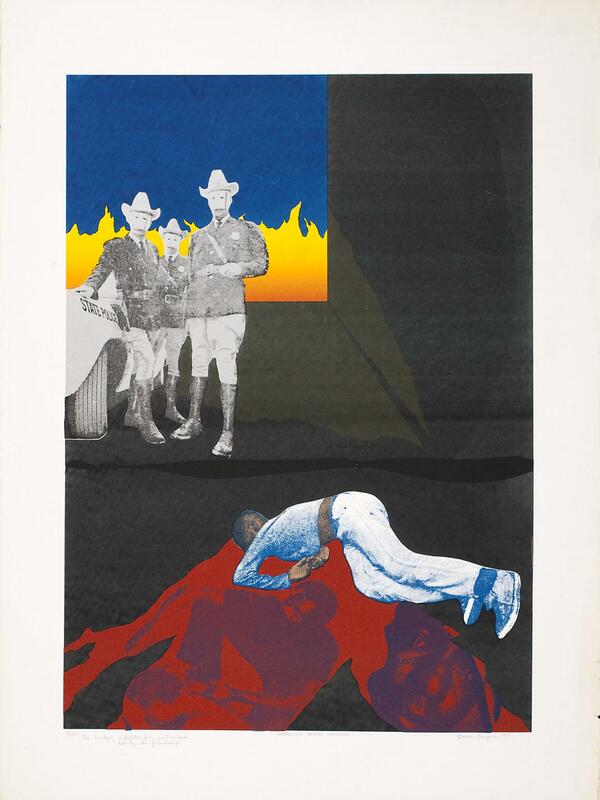 The lower portion of the poster has a photograph of a young male African American lying in a contorted position face down on the ground apparently dead, his face is concealed. Below this figure spreads what appears to be a pool of red blood. In this blood pool in a slightly darker red color there are the photos of a sad African American man's face and a crouching African American man positioned so he appears to be looking into the face of the dead figure.